Earlier this month, the B.C. Supreme Court sentenced Charles Jameson Mungo Neel to eight years’ imprisonment for manslaughter — effectively, he will be serving five years and three months due to credit for time already served. The judge acknowledged mitigating factors in the case, including how Neel did not have a prior criminal record, he is a young man — 22 years old, feels remorseful and that the offence “is out of character” for him. 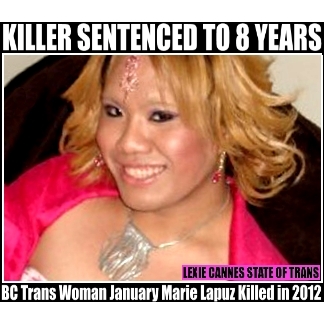 (Original article 12-31-12) The accused murderer of New Westminster trans woman January Marie Lapuz has a bail hearing Monday Jan. 7th according to the Canadian LGBT publication Xtra! That latter point was made by Leada Stray, one of the organizers of a rally to be held on Lapuz’s behalf two days before the hearing. Strays says they’re not asking people to pass judgement before Neel gets a fair trial, but rather, drive home the message that trans people are not safe in a country supposedly known for its pro-LGBT stance and leadership.